Techne® Dri-Block® heaters have been providing a safe, dry, constant temperature source in the laboratory for 50 years. Now Techne® are proud to introduce the new 2014 range offering market-leading choice, flexibility and specification. 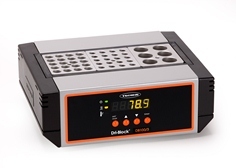 Dri-Block® heaters are a source of precision temperature control for general heating and incubating applications as well as sensitive analytical procedures particularly suited to microbiology and clinical laboratories. They are designed for precise heating of test-tubes, microcentrifuge tubes, cuvettes and microtitre plates. Techne® Dri-Block® heaters cover the temperature range from ambient +5°C to 100°C or 200°C (depending on model) using machined aluminium alloy Dri-Block® inserts as the heat transfer medium. Independent indicator lights indicate mains power and heater action. • Small, light, compact footprint - flat top surface allows units to be stacked in storage. • Can hold any combination of aluminium insert blocks, depending on the model chosen. • Digital models enable highly accurate temperature precision. • Temperature range from ambient + 5°C to 200°C depending on the model chosen. • Fast heat-up rate: 25°C to 100°C in 7-9 minutes, depending on the model chosen. • Advanced temperature control. Temperature stability at 37°C ± 0.1°C. • Outer casing is cool to the touch, even at maximum operating temperature. • Bright orange 5-digit LED digital display for fast and accurate setting of temperature and timer. • Temperature range from ambient to 100°C or 200°C, depending on the model chosen. • Accurate, reproducible, rapid and safe heating of your samples. • High quality, precision-engineered blocks provide excellent thermal contact. • Choice of models with 2, 3 or 4 interchangeable blocks. 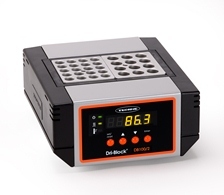 • Versatile range of interchangeable heating blocks to fit all popular sample tubes and plates. • Full range of models and options for basic and advanced applications. The Dri-Block® range has been designed to comply with all RF interference and electrical safety regulations and are CE marked. Techne® Dri-Block® heaters have earned a strong reputation for reliability. All instruments are manufactured in the UK and supplied with a 3 year warranty. The anodised aluminium Dri-Block® inserts are supplied with a 1 year warranty. Applications include incubation, boiling, inactivation, wet washing, sample concentration, enzyme digestions, enzyme activity studies, nucleic acid hybridisations and many other clinical and industrial purposes. Larger three and four-block models are available for high throughput applications such as Chemical Oxygen Demand. The innovative Techne® range also includes a twin control unit, accommodating two blocks with independent digital temperature controls. 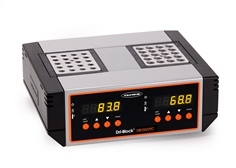 Each block can be set to different temperatures - ideal for multiple users or for applications where samples have to be transferred between two temperatures very quickly. Each digital unit features a countdown timer, which can be adjusted to time your experiment from anywhere between 1 minute and 100 hours, in 1 minute increments. To set the timer, press and hold the timer button and press the up or down buttons. Each press of the up or down buttons will increase or decrease the set time by 1 minute. If the buttons are held down, the time change will accelerate to 200 min per second. Release the timer button to activate the timer. An audible beep will indicate the timer is active. When the count-down has completed, an audible beep will be heard and the display will alternate between END and current temperature. Press the set/reset button to cancel the beeper. The unit will cool to ambient once the count-down time has completed. To cancel the timer, press and hold the set/reset button until STOP appears and an audible beep is heard. In the event of a fault occurring allowing the Dri-Block® heater to overheat, a thermal fuse will cut in and remove power from the heater when the temperature reaches approximately 192°C in DB100 models and 240°C in DB200 models - eliminating any risk. Highly accurate digital temperature control is made quick and easy with a bright 5-digit orange LED display. Each unit has a set point resolution of 0.1°C with temperature range from ambient + 5°C up to 100°C or 200°C depending on the model chosen. The Techne® Dri-Block® heaters facilitate a fast heat-up rate from 25°C to 100°C in 7-9 minutes, depending on the model chosen and all models are able to achieve a temperature stability at 37°C ± 0.1°C. Each Techne® digital Dri-Block® has venting to the side panels. Whilst helping to create a fresh modern look, the vents are designed to dissipate heat from the outer surfaces of the Dri-Block®, allowing users to safely handle and relocate their Dri-Blocks® even after extended use at 100˚C or 200˚C.